One more weekend away from home. I guess it’s the season. This time around it was a quilt retreat put on by the local shop, right here in my town. Well, almost – just down the road in Long Beach. 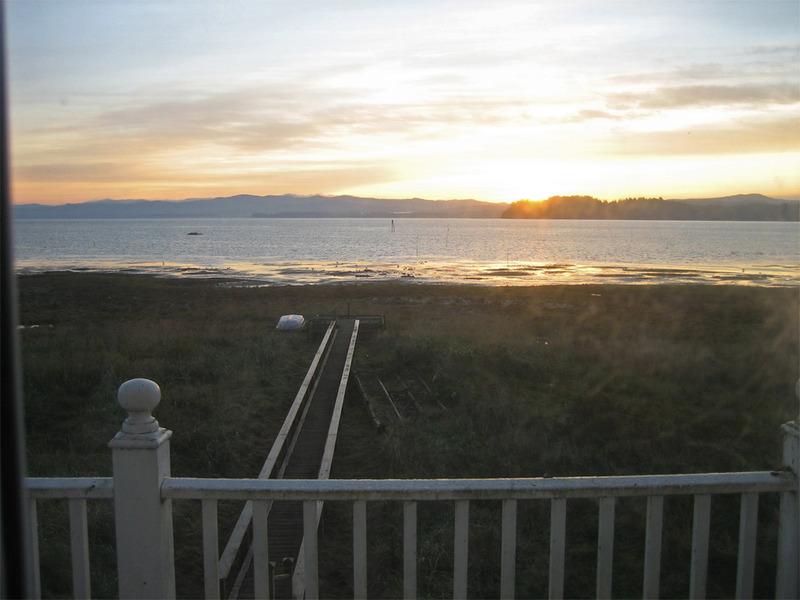 I stayed at a friend’s house over on the bay, along with four other women. It was absolutely perfect. this was the view I woke up to. Complete with the sun rising over the mountains and streaming across the bay to my window. My friend’s house was a beautiful setting for a get together. We drove into town to sew during the day, went to eat, back to the hotel to sew some more. Repeat, repeat, repeat. This retreat had only a couple dozen women, which made it a different experience than the ones I’ve been to before, with about 60 women all in a gym sewing. Since it was at a hotel in Long Beach, we had the conference room, along with a view of the beach. There were silly games – with prizes, no less. An obscene amount of snack food, and only moments of quiet throughout the weekend. Because there’s been a lot going on around here I wasn’t sure as to what my weekend project would be much before I left. 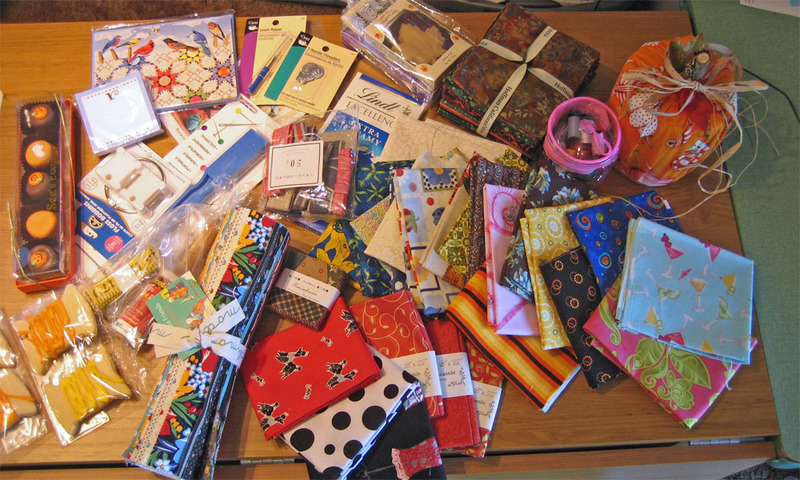 I put together a big bag of random cotton prints from my stash, along with my pretty box of duppioni silks. Friday was spent cutting strips of muslin, fabric, and fusing interfacing onto the silks to stabilize them. By the end of day one, I got one quarter of one block finished. Yikes. Never fear, on Saturday, I got another eleven, giving me three complete blocks. On Sunday I finished another couple. The walls were pretty full of other people’s projects, so I got a picture of just four of my blocks ( as yet still un-sewn together). The friends I was with got a heck of a lot done. Here’s Michelle with a partially completed bag from one of her patterns (caught in a brief moment of not singing tv theme songs) Along with that she finished binding an adorable baby quilt, and made a top for another one. 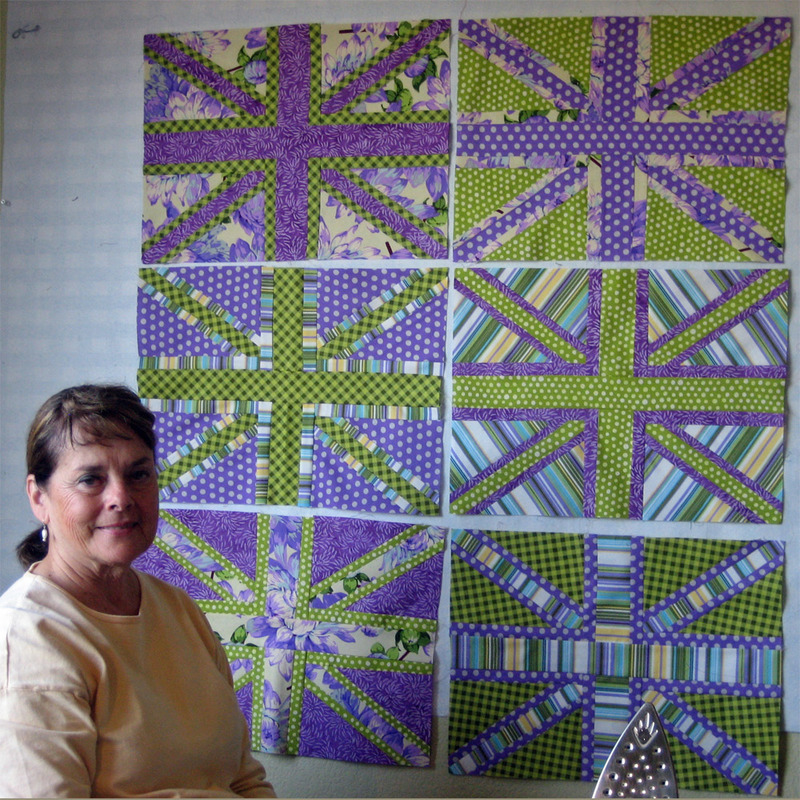 Her mom got all the blocks done for a quilt from the same pattern – Victory Garden- and I fell in love with the chartreuse and lilac color combo: I really want to make that pattern now. 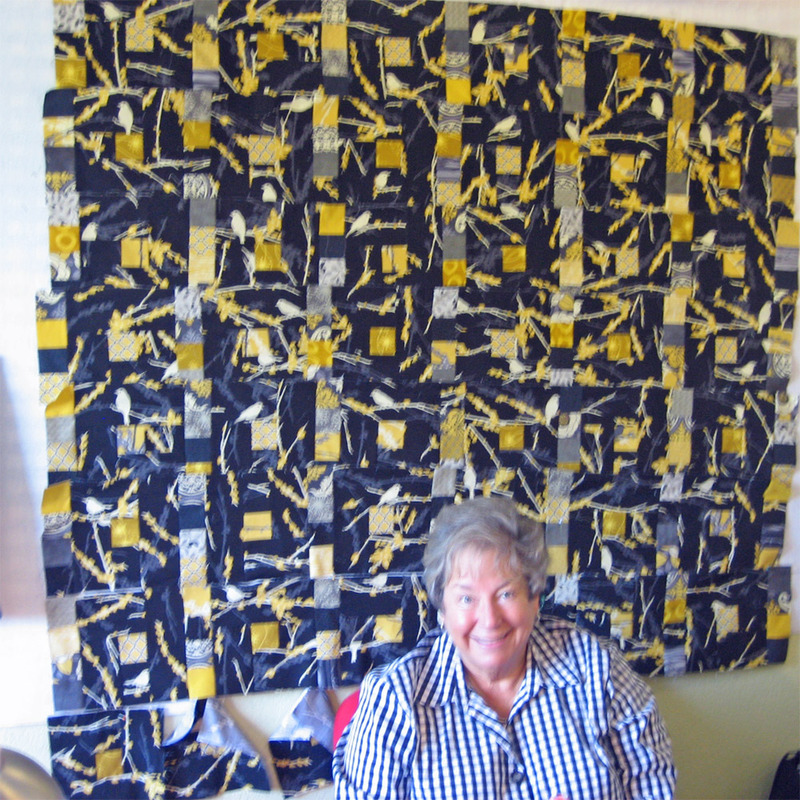 Our host for the weekend, Peggy, nearly finished a quilt top that had a ton of sewing in it in one of my all time favorite fabrics “Aviary II” in a whole new colorway of greys and yellows. Love. The fifth person in our group, Gail, made two quilt tops (my pic was too blurry) nearly completing her goal of making quilts for each of her nine brothers this year. There were silly games: fabric bingo; something called Left-Right-Center; and door prizes. Our little group of five also traded gifts. Every time I turned around, I had more fabric. (And no, I’m not in any way implying that that’s a bad thing.) Ans notions. And candy. I left home with one ton of stuff, and came home with two. In addition, I gained five pounds. I’ve been trying all week to again get caught up on the work here – lots of alterations, along with more items for the coffee shop. Tomorrow I go to Seattle to wish my mom a happy birthday. The food was again forgettable, but I went prepared for that. Maybe lots of other people thought the same thing, because the snack table was absolutely loaded with an assortment of goodies – both homemade and store bought. I made a huge pan of Pumpkin Blondies, with pecans, dried cranberries and golden raisins which were yummy. They were gone after the second day. I sat with a group of eight women who had known each other for 20+ years. They sort of adopted me, which made the whole retreat so much better. My new portable table worked perfectly, and there was no shortage of oooh’s and ahhh’s. I finished the top for my spider web selvage quilt and then started another project, also with selvages ( I hadn’t planned on actually finishing the first one and so I wasn’t very prepared with real fabric). I still need to add borders, a back, and quilt and bind it. Now, I find myself looking on ebay for one ( these dolls are not sold in the states ) and sooner or later I might get lucky and find one at a price I could afford. I could always justify it by using it as a model for clothes that I could make to sell for them, right? Did you know that their eyes change colors with the pull of a string? So, I sewed a lot over the four days. Well, technically we were there for three days, arriving on Thursday afternoon and leaving on Sunday just after lunch. I stayed up until 10:30, 11:30, and midnight each of the three evenings sewing and talking. I met a few really great people and I’m thinking I’ll go back next year. Me and my car full o’ stuff rolled out of there on Sunday afternoon pointed to Seattle. Since it was Mom’s birthday on Monday and I was halfway there already, I thought I’d show up to surprise her. My sweet hubby made me a new sewing table. and the finished portable table: Richard simply traced the outline of the insert that I already have to make the custom cutout. He put 1 x 3 long rail type legs on it affixed to the bottom of the table with piano hinges, which brings it up to the perfect height. I used an idea that I saw some 15 years ago to decorate the top ( it was on the floor of a booth in a vintage and antique mall ). I made color copies of a bunch of my favorite vintage patterns, and decoupaged them on with good old Mod Podge. Layers and sanding and layers and more sanding, it is smooth and awesome. I’m getting excited about going to the retreat ( which starts on Thursday! ). I’m really looking forward to being able to just brainstorm, not cook, sew as long as I please, with no tv or distractions other than what someone else might be working on. I’m pretty sure I’ll be a lot more comfortable this time around. Not sure what I’ll be working on yet. I’ve not finished the dresses quilt as planned, so I could work on it there, but I’m at the point where I need a lot of wall space to lay it out. More likely, I’ll devote time to the selvage quilt, and I’m busy contemplating another project with selvages to work on. I have a lot – there’s a few guild members who keep bringing me more, which is awesome. Or, maybe if I can organize it, the Tokyo Subway Map quilt. I won’t be one of the elite ones with a Featherweight to sew on, but, damn, will I have the table to die for. I am a happy woman. So, I made it through the whole retreat weekend, without taking an early out. I did think about it once or twice ( around mealtimes mostly ) but persevered and sewed on. It was a wholly different experience – the only sort of retreat I’d ever been to before this was back in Al-Anon days and the Easter convention. That was three days of speakers, meetings ( I recall speaking at one, even ) a long time ago. This retreat, on the other hand, was three days of sewing, sewing, sewing. The setting was really beautiful – in a pretty valley with trees all in fall colors, a waterfall ( which I didn’t see due to the heavy rain ) and creek which ran through the property. I shared a room with a quiet woman, which was nice. The sewing room was in the gym ( foo for no windows), which was a little walk from the lodge where we slept. The worst of it was the food. No tuna casserole, but just plain overcooked, institutional steam table fare for the most part, with the exception of breakfast. The gym was loaded with snacks and cookies and such that a lot of the women brought to share – good thing. Now I know what to expect next time. Through the entire weekend I had the feeling of being the new kid in class. Most of the 60 women who attended had either been to one of these retreats before, or came with one or more friends. Either way, everyone seemed to be buddied up with someone. I met a few people who I really wished I was already friends with, and did my best to be more outgoing. Most everyone was nice, and I tried to reciprocate the friendliness, but often felt that the only thing I might possibly have in common was this little pile of fabric. And sometimes I wondered if even that. Of course there were a lot of darned obnoxious people, which made me sort of happy to be seated in the corner of the room ( the tables were assigned by the retreat host ). 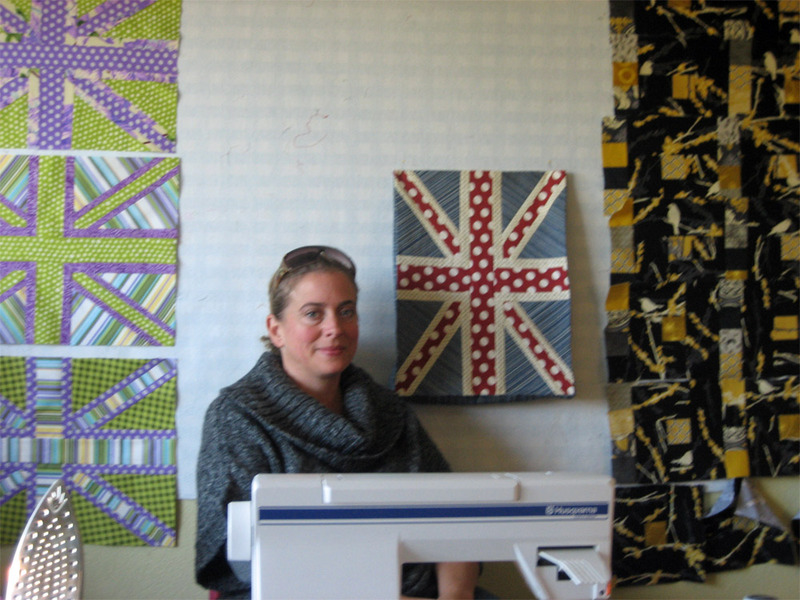 I sewed until 10:30 – 11:30 each night, and got up early. 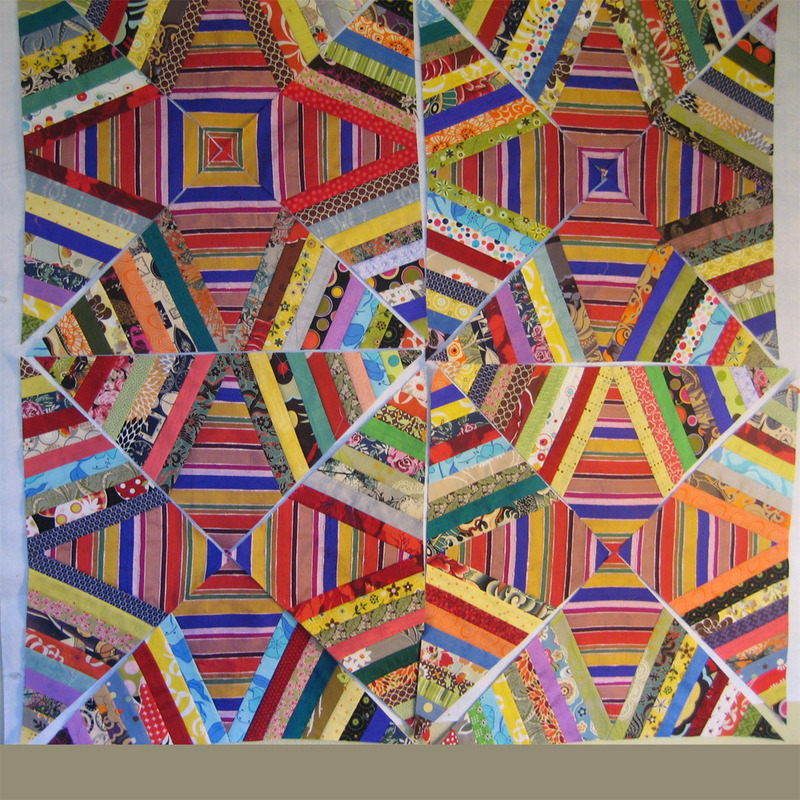 There were lots of beautiful quilts being created, along with a lot more that came for show and tell. At the table next to mine, there were four really nice women that I hope to get to know better. One of them has a small quilt pattern company – it happens that she is the designer of the orange quilt pattern that I made for the guest room. I finally started on the box of fabric that I got from grandma T’s attic a bunch of years ago. I designed a little block inspired by all that old fabric, and revised it several times. The finished design is perfect. My box of scraps ( the ones that I ran through the mangle a few months ago ) got lighter and lighter as the weekend progressed. After I quit sewing on Sunday – due to running out of thread ( somehow I didn’t take a second spool !! ) I had completed sixty-five of the little dresses. I think I only have sixteen left to go. As I completed a few, I’d put them up on a design wall that someone didn’t use, and it was a nice changing display that attracted a lot of attention. Karen ( the former quilt shop owner and organizer of the retreat ) insisted it needs to go into a magazine once finished. She suggested that I make instructions for paper-piecing it, and several people ( who are somewhat quilting professionals ) sort of collaborated and pitched ideas for setting and sashing. I had a lot of women tell me it was hands down their favorite project there. Lots of food for thought. Here they are laid out on the table: And There are so many of these fabrics that I wish I had several yards of that It makes me crazy. I kept getting asked " do you remember any of those clothes? " Huh? All of these are way older than me. I do recognize Mom’s wedding dress, and her bridesmaids dress fabric as well. All in all, I’m happy that I went, and happier to be back home. Now, I need to finish that quilt top that is to be for little Richard, and get to Astoria to get it quilted this week! Tomorrow I leave to go on a quilt retreat. To say I’m nervous about it would be an understatement. It’s just over an hour away, and I’ll be there until Sunday. I’ve never done anything like this before, and don’t really know what to expect. It’s at a small retreat center, and I think there will be about 50 or so people attending. I do know I’ll be sharing a room with someone, and we’ll all be sewing in a gymnasium. The meals are all provided ( this is really scary for a picky eater like me – maybe I should have a backup food stash in the car). I have a couple of projects to work on, and all my tools and supplies mostly ready to go. My hope is that I meet and really connect with someone who is somewhat like minded. I figure that with 50 women, odds are that I meet at least one person, right? The bummer is that I don’t think there is any internet access. The other day I made reservations for Richard to go to San Diego around Thanksgiving.This is mostly to spend time with his grandson, and of course the rest of the family. He’ll be gone ten days; while I will spend that time here, sewing and working on Christmas stuff. Then, I made reservations for Lauri and Aidan to fly here for the week before Christmas. This is really exciting – it will be so much fun to have a little one ( he’s six ) here for a week. I was able to use airline miles out of one account to purchase all of these tickets – awesome.